After a drive time-world premiere on national broadcaster triple j, ARIA Award winner Tash Sultana has released her stunning new song 'Can't Buy Happiness', out now via Lonely Lands Records / Sony Music Entertainment Australia. 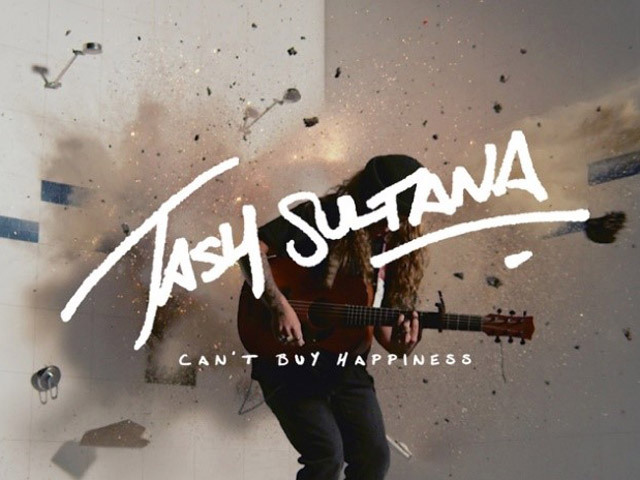 'Can't Buy Happiness', was written and produced by Tash Sultana and is an emotional and raw song, that showcases Tash's incredible vocals. Reflecting on the track, Tash says "Here's a little piece quite unlike the others. See I used to write music like this all the time, but I feel like it wasn't the right moment to release it. My heads in a different place and my ears are as well. I guess this is what happens when you're feeling good within". Released in conjunction with the new song is the explosive official video clip which you can watch below. Dara Munnis, the director and long time tour photographer/videographer explains: "The first time I heard Can't Buy Happiness was when Tash called me into the shower room attached to her dressing room in the Thunderbird Arena in Vancouver, BC to hear how cool the acoustics were. When a few months later I was played the full studio recording, I was first struck with how the song had grown and morphed from a simple acoustic jam, to a massive wall-of-sound explosive hit. I figured it would be interesting to try and match that growth in the visual that would accompany the song. Over the next few weeks, in tandem with Australian cinematographer Patrick Rohl, we hatched the narrative of rebuilding that shower room scene and shooting a performance video in it, but when the song explodes into life in the second chorus, the shower room follows suit, providing a massive exciting visual to match the dynamic of the song. Everything was built and shot over two days in a studio in Melbourne, and it's all completely real, with no visual effects in use whatsoever." Tash is already off to a flying start in 2019, with her massive sold out Australia headline tour, where she has sold over 67,000 tickets around the country. Tash recently revealed 'The Story So Far', a new three-part documentary series in partnership with YouTube Music, that shows Tash's journey from bedroom performances and busking to sold-out world tours. Tash will once again headline Byron Bay's Bluesfest in April and will then be heading to the US for a headline tour, followed by UK and Europe in July, where she will be performing at major theatres and arenas. Tash recently announced a headline show at the iconic Red Rocks in Colorado. 2018 was one of the biggest years in Tash's career to date, with the release of her debut album FLOW STATE, which debuted at #1 on the ARIA Australian Artist Album Chart and also debuted on charts across the globe. Tash was nominated for six ARIA awards, with FLOW STATE wining the ARIA for Best Blues & Roots Album. FLOW STATE was also nominated for the prestigious Triple J Australian Album of the Year award. Other recent accolades include, 400 Million worldwide streams, 'Jungle' certified Platinum, 'Notion' certified Platinum, Notion EP, 'Mystik' and 'Murder To The Mind' certified Gold. In the last 18 months, Tash has toured 20 countries, sold over 500,000 tickets, and even made music history in London where she became the first artist in the world to sell out three dates at Brixton without an album released.